Life and death, light and dark, spirit and flesh-on Wormwood Island, the lines are always blurred. For Anne Merchant, who has been thrust back into this eerily secretive world, crossing the line seems inevitable, inescapable, destined. Now, as Ben finds himself battling for the Big V and Teddy reveals the celestial plan in which Anne is entwined, Anne must choose: embrace her darkly powerful connection to a woman known as Lilith and, in doing so, save the boy she loves...or follow a safer path that is sure to lead to Ben's destruction at the hands of dark leaders. Hoping the ends will justify the means, Anne starts down the slippery slope into the underworld, intent on exploring the dark to find the light. But as the lure of Lilith proves powerfully strong, will Anne save others-only to lose herself? 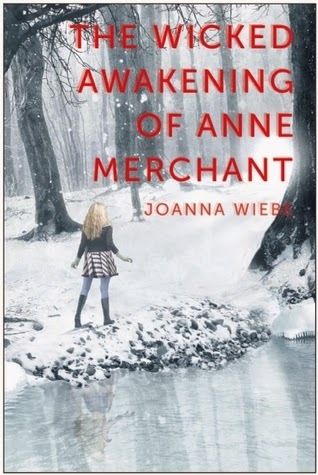 The V Trilogy by Joanna Wiebe is told in the first person narrative by 16-year old Anne Merchant. Merchant, who has spent the past 2 years in a coma, is sent to Wormwood Island, Maine to attend an exclusive preparatory school (Cania Christy) for the world’s wealthiest teens. Cania Christy is a bit on the unusual side compared to other schools. Here, teens are required to compete for Valedictorian (the Big V) of their graduating class while having a creepy Guardian following them around grading their every movement. To win the coveted Valedictorian spot, which guarantees the winner a way off the island, each student must use various means like Seduction, Backstabbing, and Inquisitiveness to get ahead. Only one person can win. THE WICKED AWAKENING picks up right where The Unseemly Education left off. Anne, even though she found a way to defeat her archnemesis Villicus and escape, is forced to return to the Island by her Guardian, Teddy. Anne finds that things have changed while she was gone. The Headmaster has been replaced with Dia Voletto (who takes a keen interest in Anne). His minions, The Seven Shining Sisters (Deadly sins), have taken up teaching positions at the school. Ben and Anne's fathers have both been disciplined for their kids actions, with Anne's father now working for the school. Anne gets a rude awakening to the fact that there are those who consider her to be a murderer, and ends up with a unwanted roommate. Ben's punishment means that he is now enrolled in Cania, and he has to participate in the Big V competition with less than a year to prepare and his ex as his Guardian. Anne's goal is to do whatever it takes to ensure that Ben survives and wins the competition. Even if it means her heart breaks, or her feelings are hurt. She also must find a way to deal with some really big secrets, revelations about her heritage that will change the way you look and feel about Anne, and the surprising return of her friend Molly Watso. There is so much to say about this book, that I worry I might let the cat out of the bag if I go too deep into the story. I'll say that Anne's choices, decisions, and actions are drastic in nature, and I think it will surprise you how the story turns out. For a brief time in this story, Ben and Anne's romance is one again adorable, and you start to hope that they find a way to eventually win against horrible odds. Then the odds are never in their favor. THE WICKED AWAKENING ends on a painful cliffhanger, but I'm certainly not going to stop reading this series before Wiebe has a chance to wrap up things up. There are so many questions as to what we can expect next. Will Anne finally accept her choices? Will she remain true to herself, or face the darkside with a gleam in her eye? In the end, I would say Awakening is better than Education because Anne faces all sorts of challenges, and unearths interesting facts about herself, and really puts her own future on the line for those she cares about. This sounds really interesting. Some how I missed the first book. I will have to look into it more. I am always on the look out for something different. I do as well! It's nice to switch things up a bit and avoid getting burnt out. The first book was a challenge to read last year, and I know many bloggers set it down without finishing, I read it but didn't love it and I won't continue the series. I am glad you made it through but i am not convinced to give this series another go. I've been curious about this series. I'm glad that you liked it overall and that Wiebe seems to have allowed Anna to grow some in this installment. Great review! Ah difficult thing with this one but at the same time so many things too. I just hope the next one will be better for you. It's the waiting that kills you. Waiting an entire year to find out what happens next is just :::sigh:: No use crying over spilt milk! I agree with you on cliff hangers Sherry. Gets to the point where I want to wait until all the books are released before starting them.